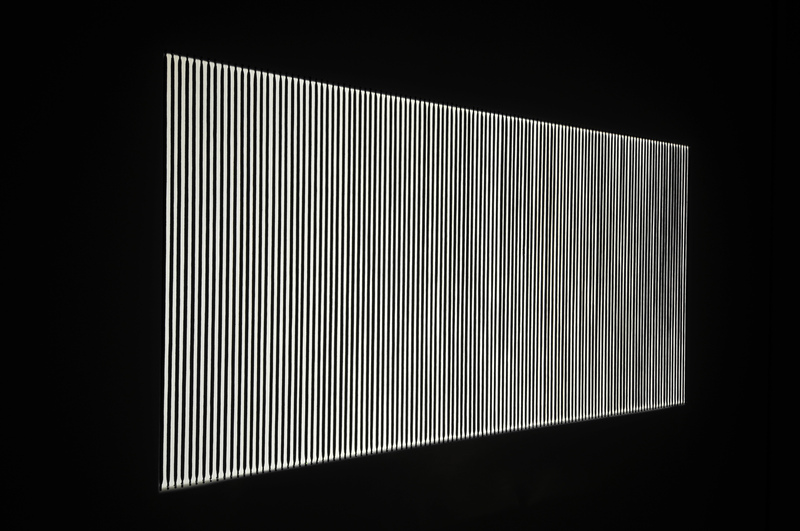 Newport Museum and Art Gallery has just been transformed into somewhere magical as it hosts Cardiff artist Simon Fenoulhet’s latest offering Lucent Lines, which opened last Saturday (30 January) and runs until 3 April. Fenoulhet is an artist that takes the most mundane and prosaic objects and Rumplestiltskins them into extraordinary objects and installations. In this show it’s neon bright plastic drinking straws, bootlaces and plastic piping, but this isn’t apparent at first. And that’s what’s so good about this work, behind the beautiful and engaging works there are layers of thinking and, in the case of the curtain of illuminated straws, some mighty complicated technology. However, as Dr Kieran Lyons, Programme Leader for Fine Art at University of Wales, Newport said when he opened the show, “what you see is definitely not what you get”. 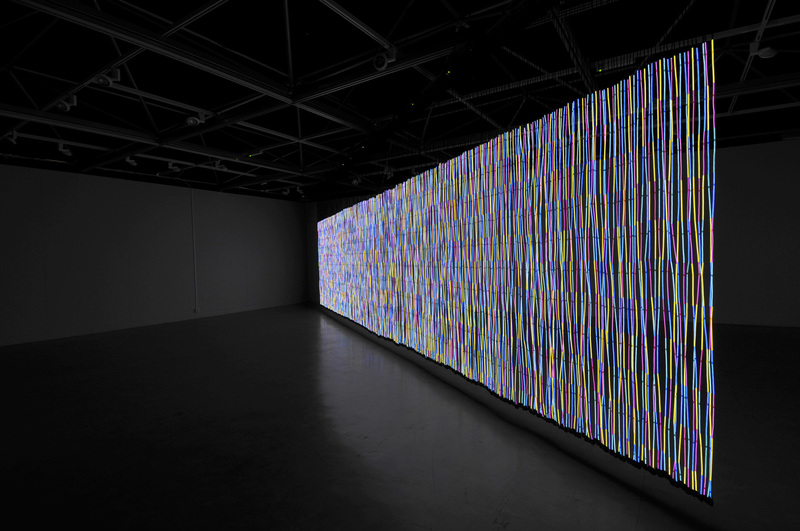 As you look at the three works they dance and sing with their inherent light, dazzling the eye so that it takes a while to realise that the pulsing, rippling neon curtain is, in fact, thousands of drinking straws, threaded onto electro-luminescent wire , programmed to switch on and off in response to a data feed from a pixel slice of a video (I told you it was complicated). My companion on the day went mad looking for the projector until I told her that the rippling was coming from inside. 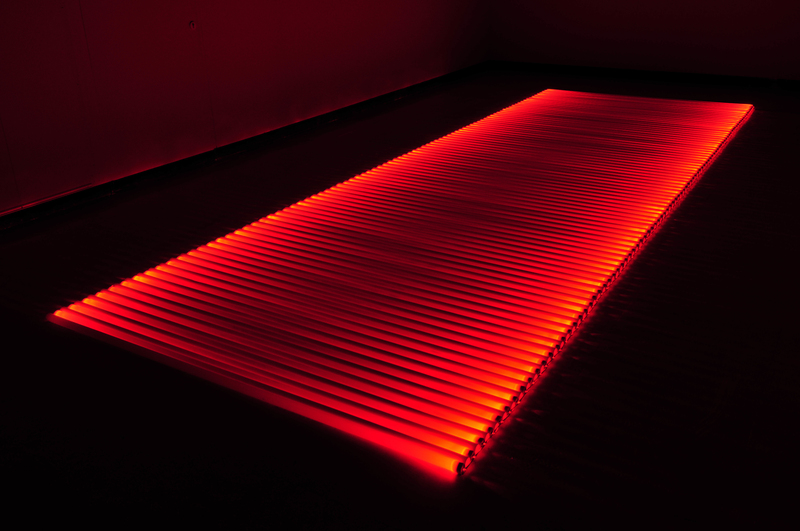 The glowing red floor piece looks like an arrangement of fluorescent red lights, until you remember that they don’t come in red, take a closer look and realise that they’re just plastic pipes with red LED lights inside. The abstract charcoal drawing is, in fact, a series of black bootlaces, their fuzzy edges echoing the idiosyncrasies of the hand- drawn mark. I’ve known Simon Fenoulhet for more years than either of us cares to remember and have always been a fan of his championing of the overlooked, the ordinary. When he first showed me his early experiments with electro-luminescent wire it was in his studio and was just a single strand, suspended from the ceiling. Then he turned the lights off, flicked a switch and started to describe what he wanted to do and I was hooked. No description is going to do this show justice so I strongly recommend that you see for yourself. The majority of Fenoulhet’s work is made to commission and for a specific site, so when the show’s over, it’s packed away and only exists in the memories of those who saw it, although these works are probably more tourable than his last major show at the Glynn Vivian Art gallery in Swansea, but don’t wait for the tour go and see it…now! And it’s worth seeing the newly titivated Museum and Art Gallery (NMAG) in John Frost Square. For a while it was stuck in the middle of a major development that stalled with the credit crunch, but things are moving again and looking up for the gallery. They’ve also re-hung some gems from their collection, but it’s the accommodation of some curatorially challenging installation work in a space designed for hanging pictures that’s really impressive. Congratulations are due to Sandra Jackaman, Shaun Featherstone and the team at NMAG and, of course, to Simon Fenoulhet. This entry was posted in Art in Wales and tagged Electro-luminescent wire, Glyn Vivian Art Gallery, Keiran Lyons, Newport, Newport Museum and Art Gallery, Simon Fenoulhet, University of Wales by Emma Geliot. Bookmark the permalink. 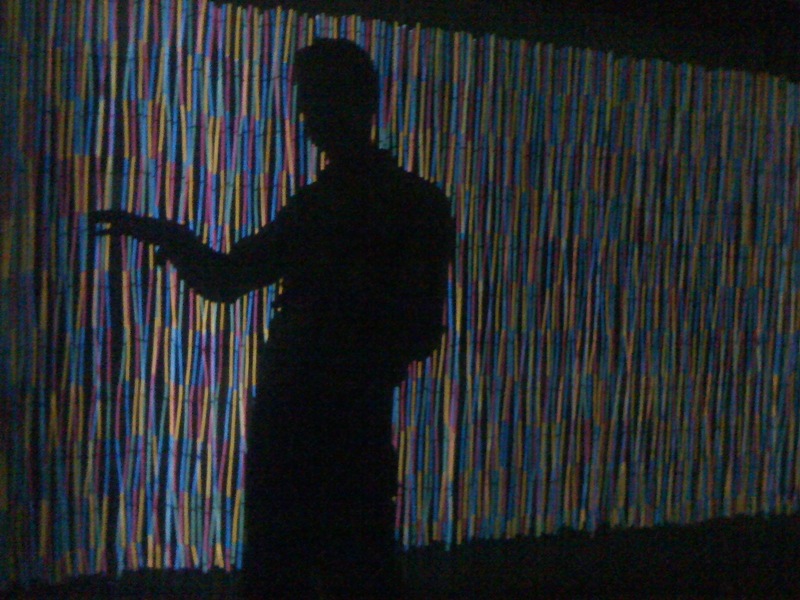 The video of Lucent Lines, with an interview with Simon is now live on Culture Colony.